A Mediterranean mogul in all its glory – spectacular Spain has more than a few surprises up its sleeve. At a glance, the miles upon miles of sweeping golden sands, majestic mountains and swoon-worthy whitewashed villages are enough to get any holidaymaker hooked. After all, what's better than a week or two of sun, sea, sangria and siestas? The very definition of a dynamic destination, holidays in Spain cater for everyone. From hiking havens to bronzed beaches, and laid-back living to the high-class lifestyle – all just a few hours flight from the UK. Oozing with charm and sun-drenched from top to bottom, it's a place that's sure to spark your wanderlust. Year-round sunshine means there's never a bad time to visit spellbinding Spain. Sizzling summer temperatures can reach up to 35°C in August, while April to May and September to October offer up perfect climes for outdoor adventures. 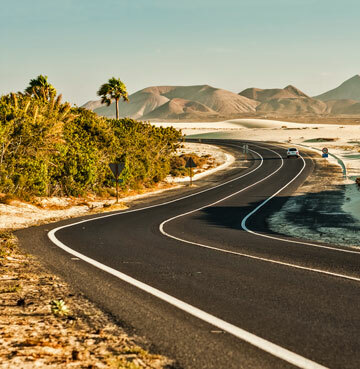 The Canary Islands rarely dip below the 20°s – making it a great winter holiday destination. Uncover a unique world all on one coveted coastline. National Parks, amazing architecture, captivating castles, Blue Flag beaches, lively nightlife – there's nothing Mainland Spain can't do! Whether you prefer the simple life tucked away in a rural retreat or the excitement of a bustling beachside resort, a holiday in Mainland Spain can be as jam-packed or relaxed as you want. Days melt from one to the next, and it's easy to see why no one's in a rush. 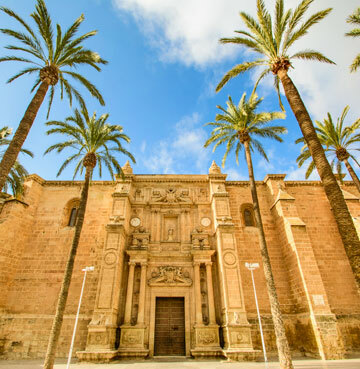 Lounge around along the characterful 'Costas' or go history hunting in picture-perfect Almeria. 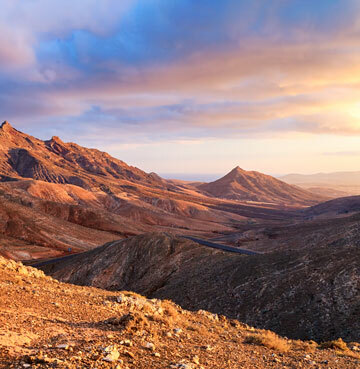 Andalucía's Sierra Nevada Mountains offer up dramatic landscapes and outdoor activities aplenty, while nearby Barcelona is teeming with tasty tapas restaurants and amazing architecture. The beach is just the beginning for the show-stopping Canary Islands. You might think you know Spain – think again! A stone's throw from Africa's North West tip, the Canaries have done their best to mimic the Sahara-style dunes. Island interiors of luscious forests, majestic mountains and lunar landscapes are begging for you to break out the walking boots. Outdoors is most definitely the place to be! Surfs up for adrenaline junkies, with a whole host of wet and wild watersports to dive into. Soak up every second of the islands' wild natural beauty on a holiday to the Canaries. Every kind of holidaymaker is catered for when it comes to things to do in Spain. Experience a kaleidoscope of colour and tradition from the magical home of fiesta and flamenco. Energetic and effervescent street entertainers perform their world-famous moves in town squares and cobbled streets – perfect for a balmy summer's evening. World-class golf courses pepper the Costas – especially beautiful Blanca, as well as a wealth of watersports and family-friendly facilities. Spain as a whole is a nature lovers' paradise. Velvety hills, majestic mountain ranges, blissful beaches and picturesque national parks – not to mention the only European desert. Used as a backdrop for countless western movies, the dusty badlands wouldn't look out of place in America's Arizona. If it's good enough for Hollywood, then it's good enough for us! 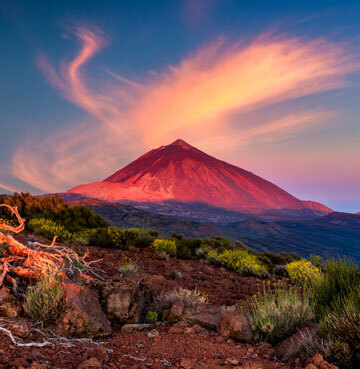 From the driest region to the highest, Tenerife's Mount Teide sits at the heart of the island. Stamped with the UNESCO seal of approval, it's the most visited national Park in Spain. Traverse craters, still-active volcanoes and picture-perfect rivers of petrified lava! Being so blessed with beautiful scenery means there's plenty more where that came from. Mallorca's Sierra de Tramuntana Mountain range, as well as the mainland's infamous Sierra Nevada mountains both make for excellent outdoor exploits. Trek until your heart's content over the rugged ridges and snow-capped peaks. 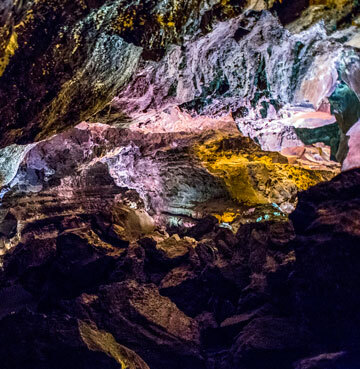 Taking things from holiday highs to lows, Lanzarote boasts an underground world too good to miss. One of the longest volcanic tunnels in the world, the Cuevas de Los Verdes are impressively illuminated to highlight the wonderful and whimsical shapes the lava left in its wake. Culture vultures will feel like they've died and gone to heaven with a holiday to Almeria or Andalucía. Dramatic landscapes are crowned with unmissable UNESCO sites, from castles to palaces and an amazing Alcazaba Arab Fortress. Remnants of history can be found at every turn, not to mention intricate architecture, manicured gardens and fantastic fountains. Step back in time and get to grips with Spain's astounding cultural heritage. Is there such a thing as too much choice? If there was, Spain and its beaches would take the title! Over 5,000 miles of collective coastline is yours to explore. Whether you're after peace and quiet, wild waves for a spot of surfing or bucket and spade shenanigans and good old fashioned family fun – there's bound to be a beach for you. Beach holidays in Spain happen to be a speciality of ours, with villas dotted all over the dreamiest coastal destinations. Sun worshippers will love Mallorca's Puerto Pollensa and its 1.5km stretch of Blue Flag sands, while surfers can make a splash at Lanzarote's Playa de la Cucharas. Andalucia's sun-baked coastline is decorated in whitewash towns and craggy cliffs, with mountain ranges towering high above its golden sands. An idyllic location for anyone after a bit of tranquillity and seclusion. Of course, it goes without saying that no trip to Spain would be complete without sampling a plate (or 10) of traditional tapas. Little dishes of joy are brought to your table, and all table etiquette goes out the window. Fingers first, dig in to as many different concoctions as your waistline can manage – it's even a hit with fussy eaters! 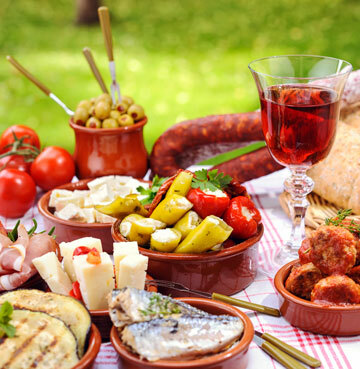 A Spanish social ritual and satisfying cheap eat, pour another glass of sangria and keep the drinks and dishes flowing. For one of the most unique dining experiences, head to Timanfaya National Park in Lanzarote. Showstopping panoramic views of the otherworldly landscapes are only bested by one thing – your dinner is cooked over an active volcano! Shop 'til you drop takes on a whole new meaning in Spain. From up-scale shopping districts in Marbella to quaint boutiques in ancient Pollensa, retail therapy has never been so good. Exclusive brands line the Costa coastlines, with well-loved designer stores, magnificent malls and unique fashion finds everywhere you look. Old towns are full of traditional shops oozing with craft items and authentic local products. Markets are an essential part of Spanish culture, so be sure to swing by if you spot one. Atmospheric and colourful, hunt down unique souvenirs and one-of-a-kind keepsakes. 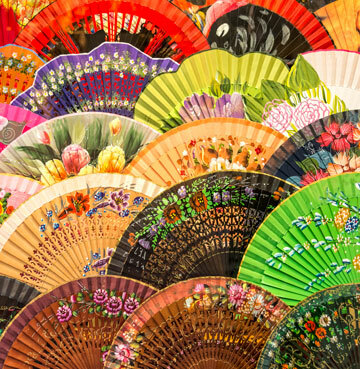 Spanish fans are a great purchase for keeping cool in the sizzling summer months! Four wheels and Spanish adventures go together like fiestas and flamenco. With so much diversity in one destination, day trips are a great way to sample as much as possible – just like you do with tapas! Cruise along the captivating Costa coastline and find off the beaten track beaches, or day trip to the iconic city of Barcelona. Take things to new heights with a mountain road trip through the Sierras. Wind through endlessly twisting roads and enjoy the perks of roaming freely on your own steam. Drive to dizzying vista points and marvel at the sun-drenched foothills below. Stumble upon magical Moorish towns and baron badlands, and don't forget to allow plenty of time for pulling over and taking pictures! The Spanish social calendar is chock-a-block with wildly whacky entertainment and events, as well as long-standing cultural traditions and religious festivals. Mind-boggling scenes unfold, from the fanciful fiesta of Las Fallas to the crazy costumes and outlandish parades of Tenerife's Carnival. Based on the prestigious Brazilian carnival itself, the event boasts endless parties, spectacular shows and drag queen competitions. All combining to create one of Spain's most famous festivals!